Ask the expert: How can I get my toddler to stop grinding her teeth? My toddler’s molars are coming in and she is grinding her teeth. Is this bad and what can I do to help her stop? Teething is a natural process. 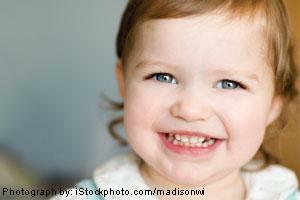 Infants start getting their first teeth around the age of six months (plus or minus three months). All the front baby teeth (incisors), top and bottom are generally in the mouth by around 12 months of age. First baby molars come along around 14 to 16 months, then the baby eyeteeth and finally the second baby molars by about 2 1/2 years. Teething can occur at any of these times but generally parents tend to equate teething experiences around the time that the baby molars are coming along and interestingly their child is much more interactive with them. Toddlers may experience a pushing feeling on the gums as teeth ‘cut’, which can cause discomfort. What teething does not cause is a fever, despite the urban myth that you will find on many parenting websites. If your baby is experiencing a fever, see your family doctor, as it could be an ear infection or another kind of infection. 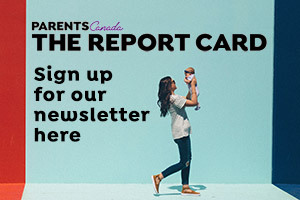 Research has shown that during teething, toddlers will experience, in order: increased biting, drooling, gum rubbing, sucking, and last but certainly not the least, increased irritability that can be associated with disruption of eating and sleeping habits. Children may grind teeth as they come in and this is not harmful. It can sound horrible when they grit them together, but don’t worry – teeth are built to withstand this. Try giving your baby a cold clean cloth to chew on or a cool teething ring. If chewing is not managing the discomfort, use of an appropriate dose of an analgesic (pain killer) like baby acetaminophen or ibuprofen is recommended. Check with your family doctor, dentist or pharmacist for the proper dose. Dosing of these medications should always be based on your child’s weight. A dose 30 minutes before a meal will help. Most importantly be sure your child keeps drinking. Avoid teething gels that contain benzocaine. This local anesthetic simply numbs the gum and does not relieve the pressure. These gels can also numb your toddler’s throat, which affects the ability to swallow, and your child could have a serious choking episode. Also, if used excessively, teething gels can affect the blood’s ability to supply oxygen to your child. The resulting condition –methaemaglobinemia – needs emergency treatment. Ensure your family physician is looking in your infant’s mouth and asking you about your child’s oral health, starting at six months of age. Book your child’s first visit to the dentist by age one or within six months of the first tooth coming in, whichever comes first. Your dentist will talk to you about teething, examine your child and talk about other things like how to avoid cavities.